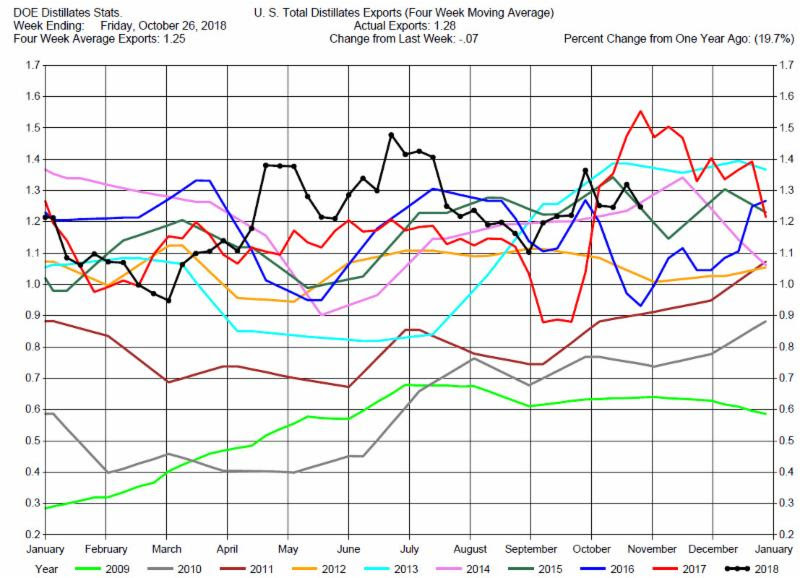 The DOE reported Total Crude Oil Inventories increased by 3.2 million barrels to 426.0 million barrels for the week ending October 26, 2018, while expectations average was for a 3.6 million barrel increase. The range of expectations was from a 2.0 million barrel draw to a 11.2 million barrel build. 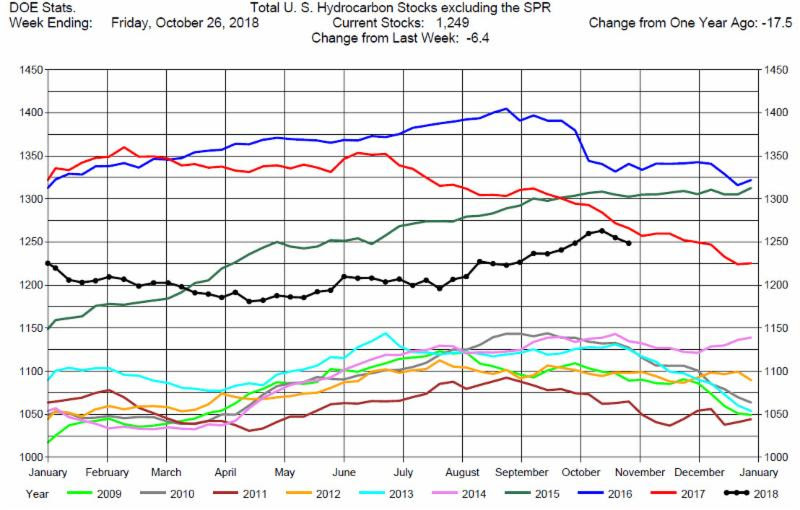 Overall hydrocarbon supplies decreased by 6.4 million barrels to 1,249 million barrels. 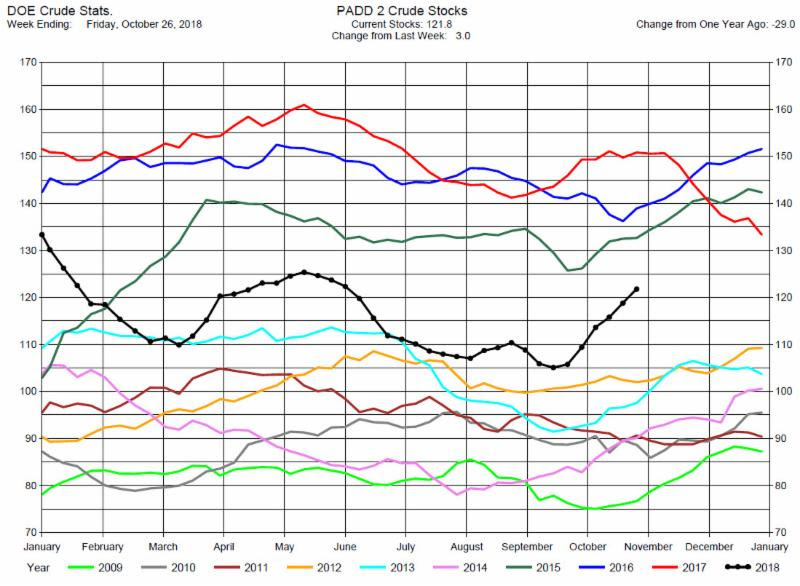 Crude Oil Production increased by 300,000 barrels per day to a new record 11.2 million barrels per day. 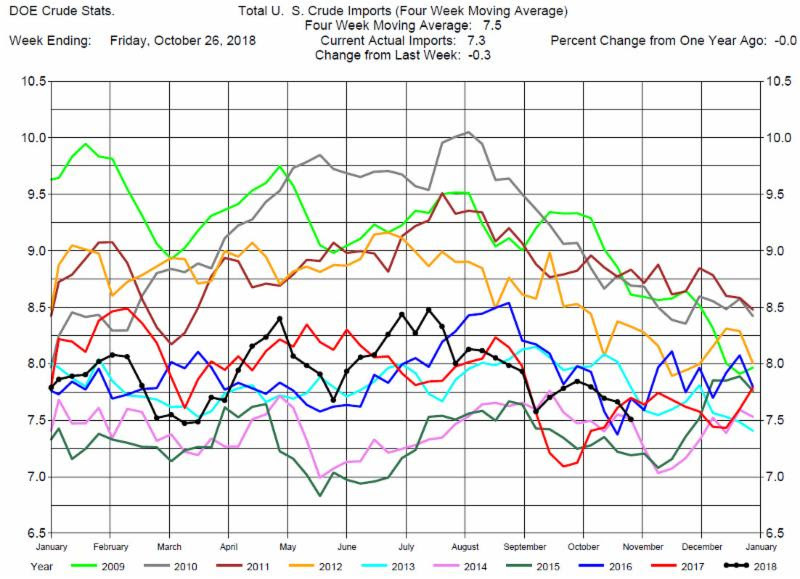 Total Crude Imports were down by 300,000 barrels per day to 7.3 million barrels per day. 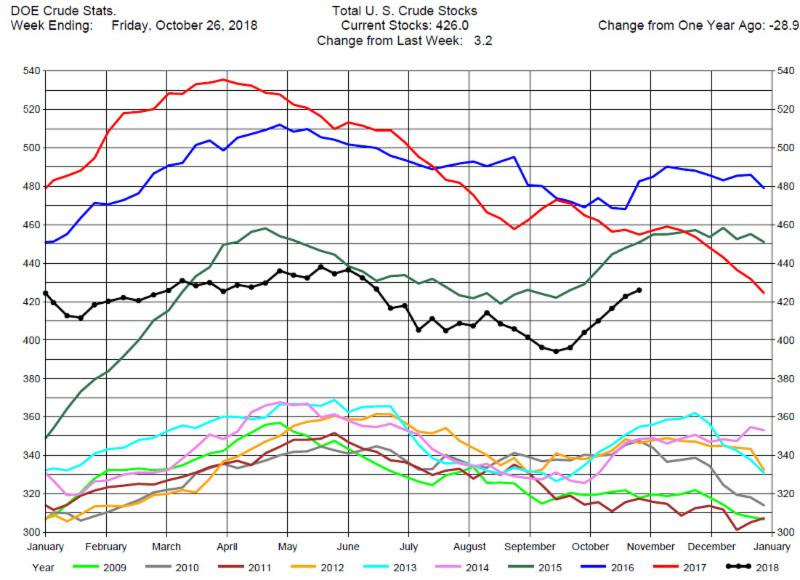 Total Refinery Crude Runs were up 100,000 barrels per day to 16.42 million barrels per day. This report was actually bullish for crude oil prices and the market initially rallied. 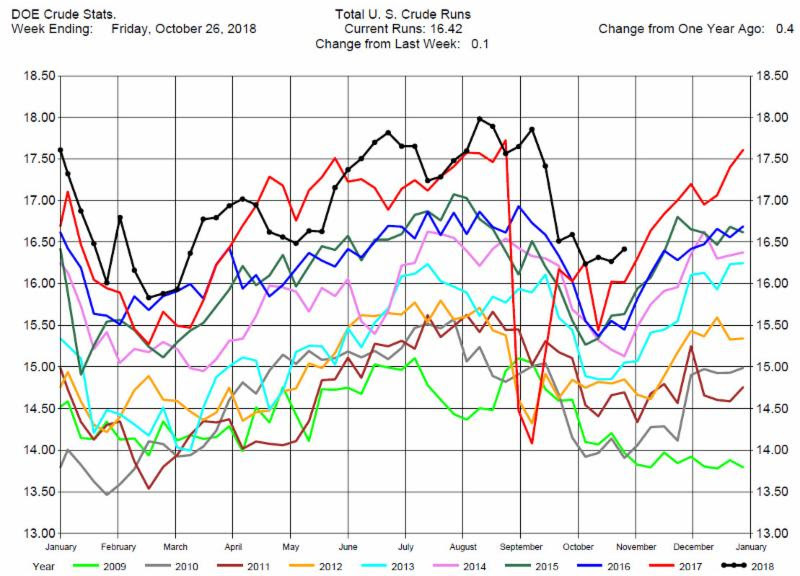 An hour later prices peaked then reversed and ended the day down over $1 a barrel. With the continuing increased volatility in the market we would recommend to be on the sidelines. 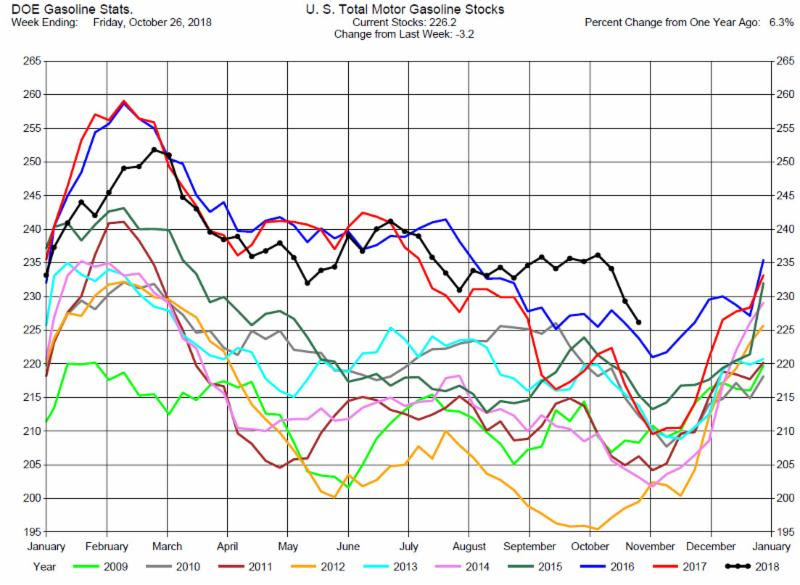 Gasoline Stocks Draw, Greater than Expectations. 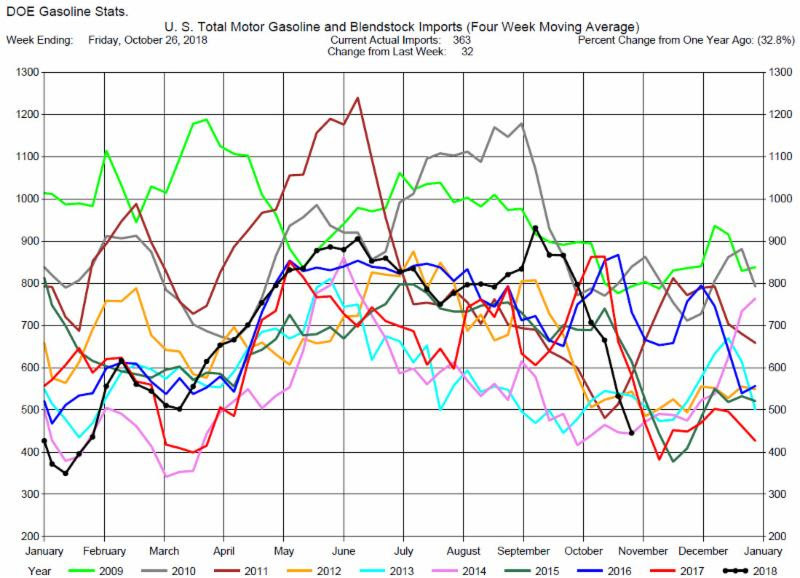 Total MotorGasoline Inventories decreased by 3.2 million barrels to 226.2 million barrels for the week ending October 26, 2018, while expectations average was for a 2.3 million barrel decrease. The range of expectations was from a 3.5 million barrel draw to a 1.0 million barrel draw. 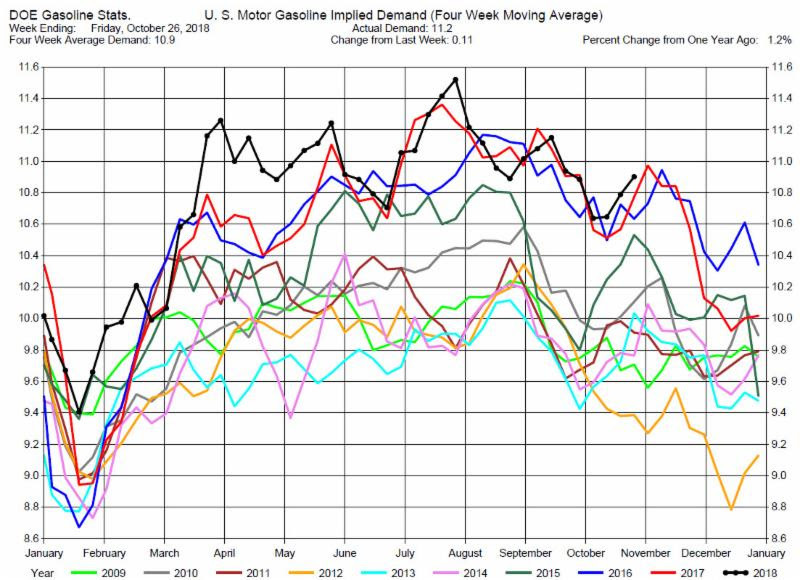 Implied Demand was up by 110,000 barrels per day to 11.2 million barrels per day. 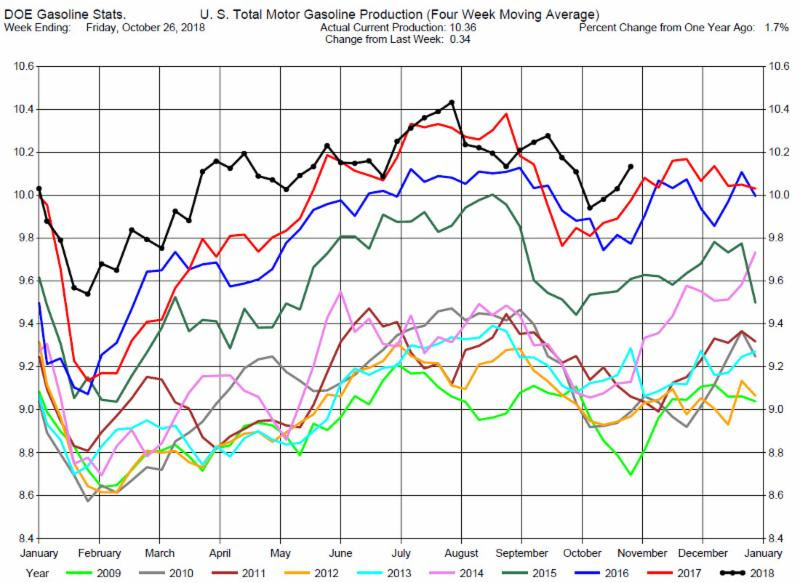 Gasoline Production was up by 340,000 barrels per day to 10.36 million barrels per day. 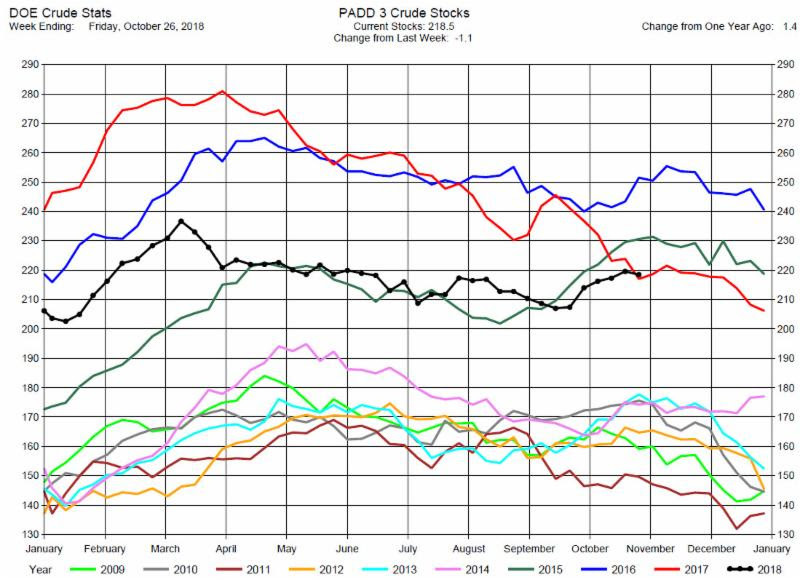 Despite the decrease in stocks Gasoline prices dropped and ended the day down by more than $2 a barrel. Market sentiment remains bearish to prices so we recommend consideration of short positions, especially in the cracks. 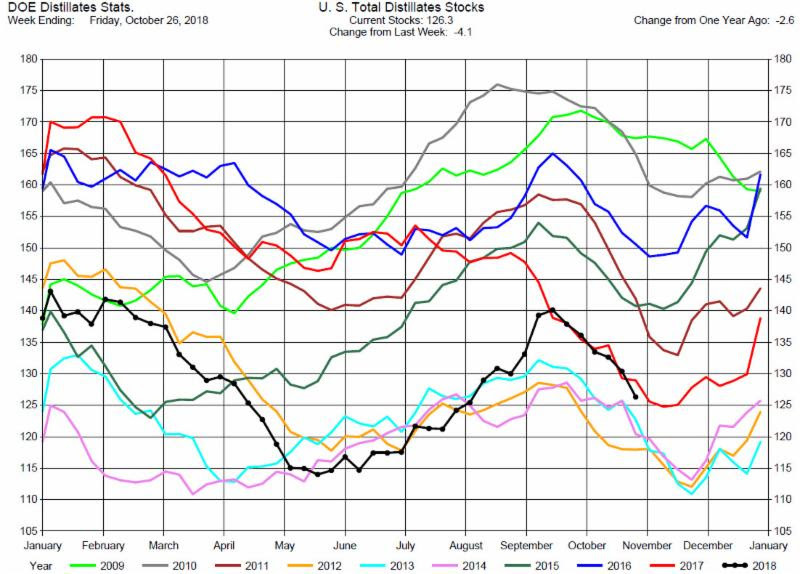 Total Distillates Stocks decreased by 4.1 million barrels to 126.3 million barrels for the week ending October 26, 2018, while expectations average was for a 1..9 million barrel draw. 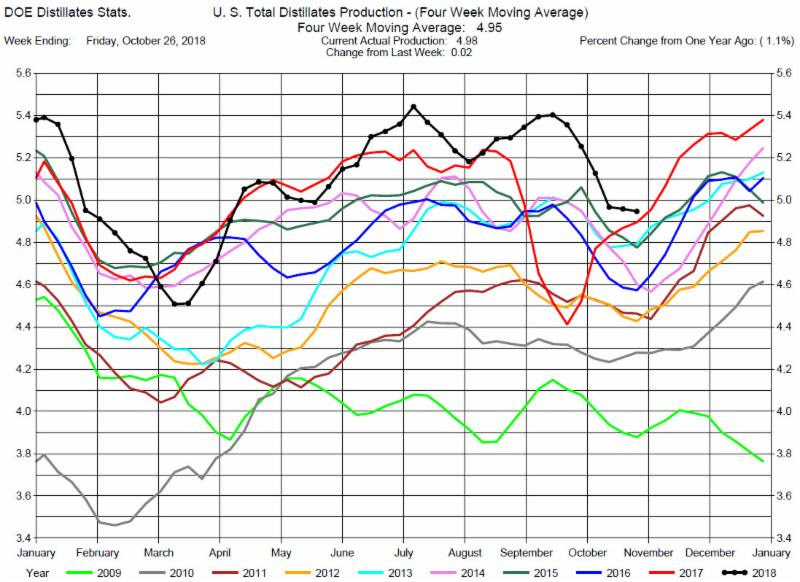 The range of expectations was from a 3.1 million barrel draw to a 1.0 million barrel draw..
Total Distillates Production was up 20,000 barrels per day to 4.98 million barrels per day. 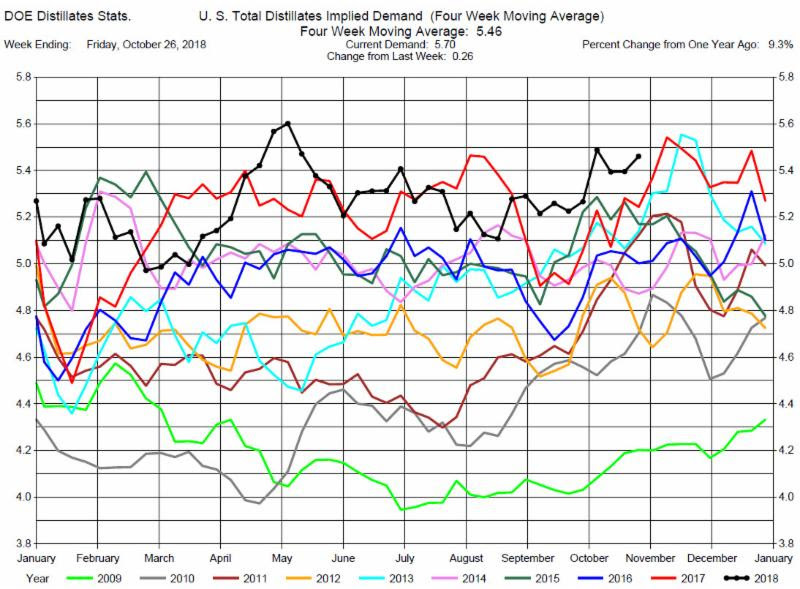 Total Distillates Implied Demand was up 260,00 barrels per day at 5.70 million barrels per day. 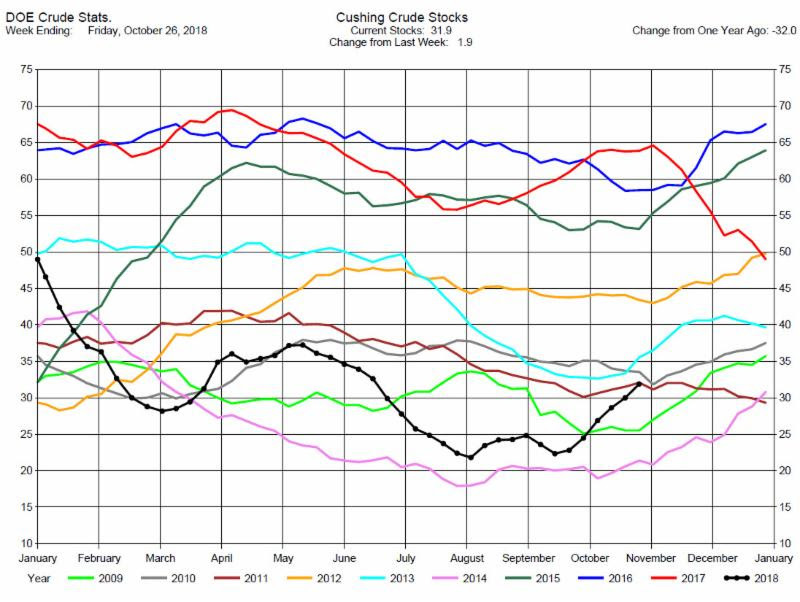 Heating Oil price behavior followed Crude Oil after the DOE data release. However, Heating Oil ended the trading day down only 40 cents. Crude Oil was down over a $1 so the Heating Oil to Crude Oil Crack Spread increased by over 60 cents. We maintain our suggestion of consideration of long positions in the Heating Oil Cracks.